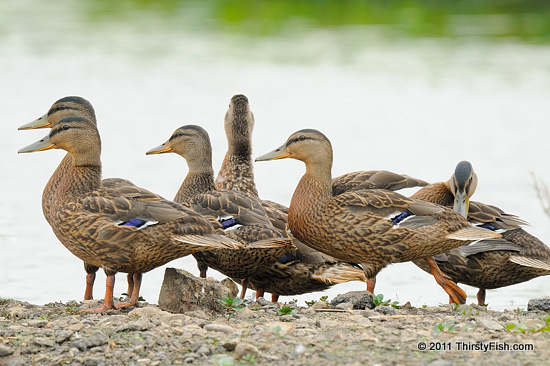 A "sord" is the collective noun for a flock of mallards. Collective nouns for birds can be pretty creative and some linguists have argued that some of the lesser-known ones are not needed for practical purposes. The Mallard is one of the most widely distributed ducks in the Northern Hemisphere. It is sexually dimorphic; the males have a bright green or blue head while the females are light brown as can be seen in the photo. Both males and females have blue/purple speculum feathers. Mallards are also commonly known as wild ducks. You can see female Mallard in flight in a prior post.